Yes, you can even manage multiple-tutors! With My School Books, if your business grows, you can easily add additional tutor accounts. Just change your plan to one with multiple tutors, and we’ll instantly upgrade your account with all the features you need to manage your growing business. If you’re starting a new free trial account, select the “I have a business with several teachers” option and you’ll start with all the multi-teacher features from day one. Share the love (and the work)! With My School Books you can let your individual tutors login to their own accounts for things like taking attendance and scheduling. 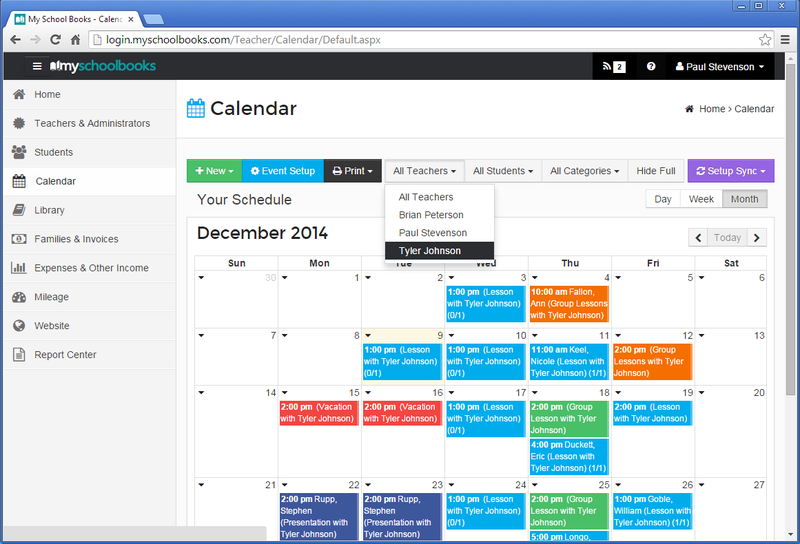 Non-admin tutors can only view and manage their own schedule, attendance and students. 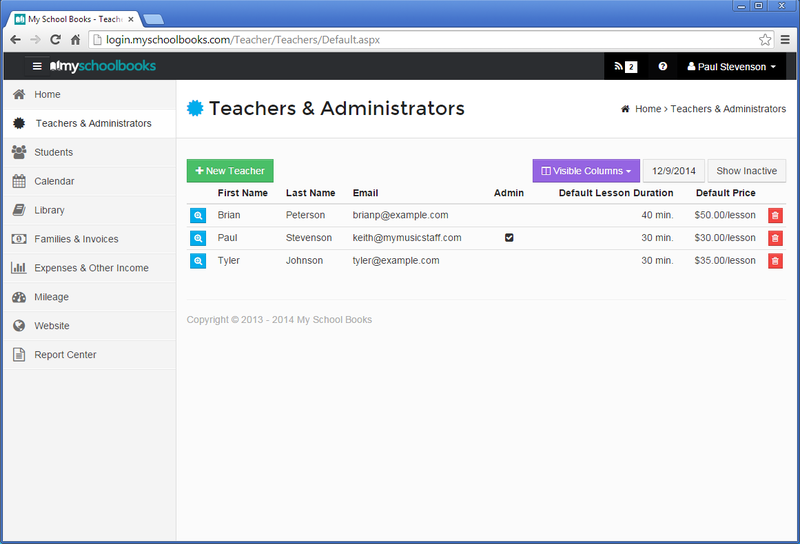 Administrators can manage any tutors in your business, plus create invoices, reports and more. 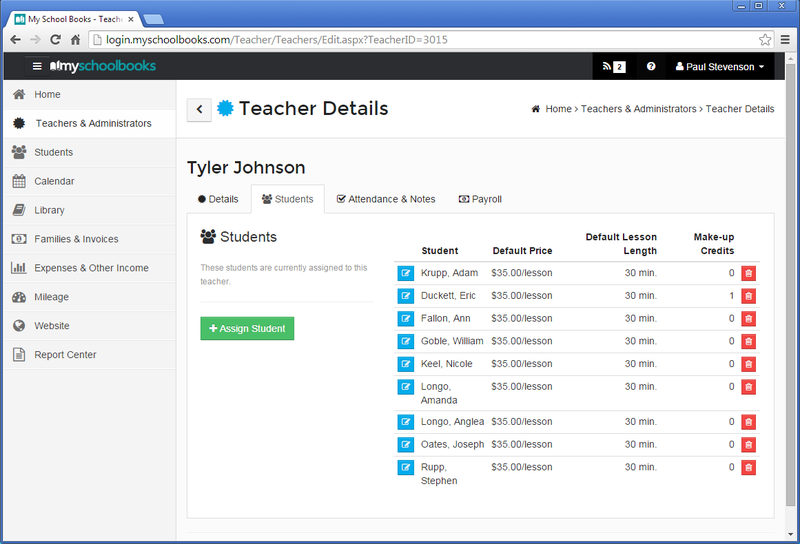 With My School Books, each student can be assigned to multiple tutors each with their own billing profile. You can charge different rates for different tutors, and even mix per-lesson billing with flat monthly rate billing on a case by case basis. When you schedule lessons, My School Books will automatically apply the appropriate charges for that tutor/student relationship and make invoicing a snap. My School Books makes tracking payroll in a multi-tutor school a breeze. Just like with invoices, tutor payroll entries are automatically created when lessons are scheduled, and are connected with student attendance. Earned income from each lesson and event can be calculated based on a percentage of tutoring revenue, or a flat hourly rate based on the number of hours taught. Getting started with tutor payroll is quick and easy. Simply edit each tutor from the “Teachers & Administrators” page, and turn on their payroll option at the bottom of the Teacher “Details” tab. With My Schools Books “Billable Hours” report you can easily find out who the top performers in your school are. My School Books has all the data you need at your fingertips so you can quickly see billable hours taught, billable lessons taught, total school revenue, and more! All this plus more from the same interface you already know and love! You don’t need to learn a completely new system, or say goodbye to all your student and lesson data just because your business is growing. With My School Books to can start small (or big), and grow when you need to.